This issue features fourteen peer-reviewed papers originating from The 6th International Symposium on Nanostructured Materials and Nanotechnology. It includes Nanostructured coatings by cluster beam deposition; a new greener synthetic route to cadmium/lead selenide and telluride nanoparticles; and much more. Held in January 2012, during the 36th International Conference on Advanced Ceramics and Composites (ICACC), the symposium covered a broad range of issues, including synthesis, processing, modeling, and structure-property correlations in nanomaterials and nanocomposites, enabling scientists, engineers, and technologists from around the world to explore the latest developments in the field. 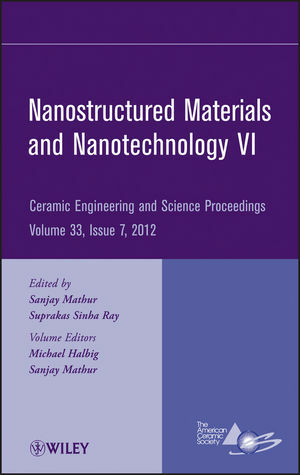 Sanjay Mathur and Suprakas Sinha Ray are the authors of Nanostructured Materials and Nanotechnology VI, Volume 33, Issue 7, published by Wiley.